I'm back with another little card to share with you! An A5 CAS Birthday card made for my Dad! I simply scored, folded & cut my card base from an A3 sheet of cardstock. The corners were rounded with a woodware punch. Inked through some sequin waste with Black Soot distress ink. The letters are die cut & the stars were punched. The film strip & stars are popped up on foam squares for added dimesion. A brilliant masculine card Dawn, fabulous CAS design. Oh, I love the rounded corners, Dawn! The sentiment done in gold is wonderful. Now, donning my DT hat -- It's wonderful to see you playing along in our "Guy Cards" challenge at QKR Stampede this week. Good luck and I hope we see you again soon. A great male card Dawn. Lovely CAS design. Fading out the edges of a background is a clever way to preserve white space and keep the card very CAS! So glad you joined us at CASOlogy this week! What a GORgeous CAS card.. I LOve your colours and design. You did a great job with this color combo and I love your design, Dawn! Thanks so much for playing along with us this week at Addicted to CAS! 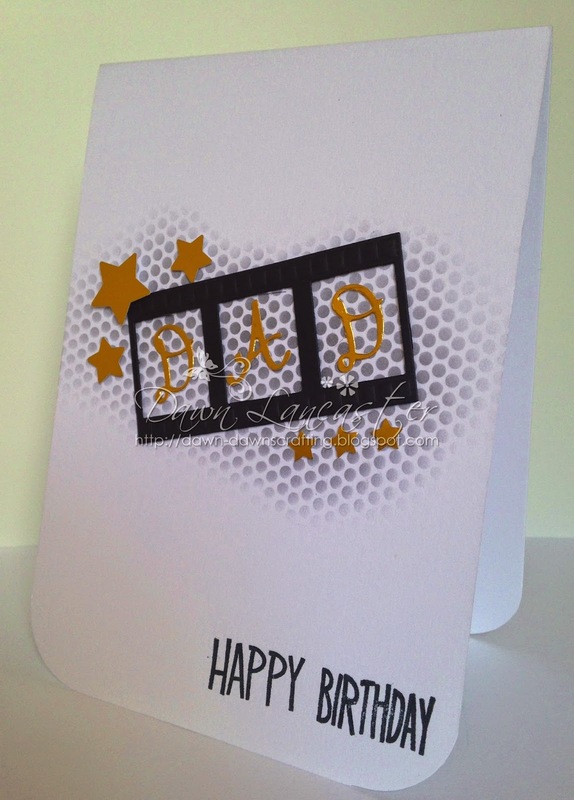 Hi there Dawn, loving this card, a simple but really effective design. I like the sequin waste background too. Enjoy the rest of your week. Love how you spelled out dad in the filmstrip! Fabulous card Dawn! Fabulous CAS guy card and great background. Thanks so much for joining us at Seize the Birthday. A terrific masculine dad card! Thanks for playing along with us over at Seize the Birthday and for using the topping. Take care!